Ric Flair is one of North Carolina's favorite sons. He's also a stylin', profilin', limousine ridin', jet flyin', kiss-stealin', wheelin' and dealin' son of a gun, so when the 49ers invited him to address the team, he said hell yes. But now the 49ers are heading to Charlotte, and Panthers fans aren't so eager to forgive. 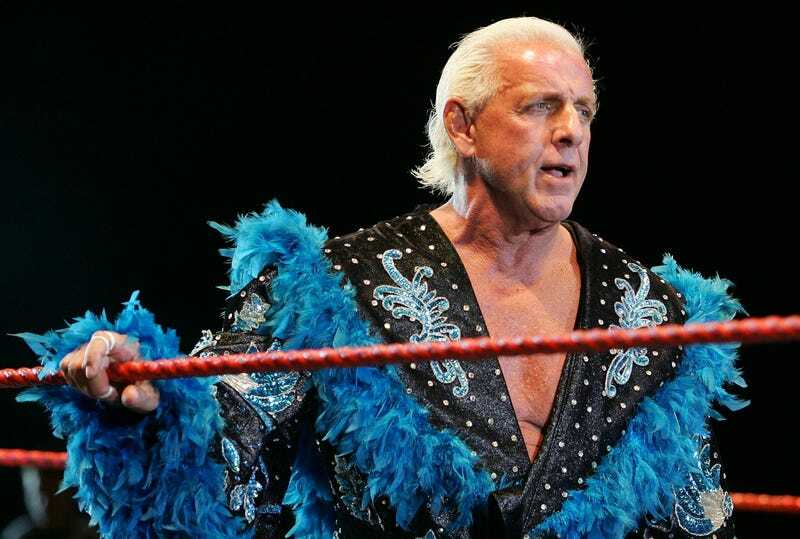 "Ric Flair's heart is with the 49ers all the way to the end," Flair said. That's news to Carolina fans, since Flair used to live in Charlotte, owned Panthers season tickets, and was frequently shown on the scoreboard. His heel turn rubbed receiver Steve Smith, a big Flair fan, the wrong way. "I'm not sure if he'll get the invite" to Sunday's division matchup, Smith told the Charlotte Observer. "That Golden Gate Bridge has been burned." Now comes a statement from Flair's agent, confirming that he won't be in the house this weekend and claiming that angry Panthers fans attacked Flair online, some even offering up death threats. People, chill out. Everyone knows football's just as fixed as wrestling, and you should enjoy it for the entertainment value.